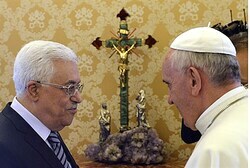 Pope Francis apparently plans to heed Palestinian Authority (PA) Chairman Mahmoud Abbas’s calls, and use his upcoming visit to Israel in May as a propaganda move for the Palestine Authority (PA) against Israel, according to reports in Makor Rishon. Deputy Foreign Minister Ze’ev Elkin (Likud Beytenu) spoke with Arutz Sheva about the subject, noting that the foreign ministry is preparing for the visit and keeping an eye on developments between representatives from the Vatican and the PA.
“Our role is to ensure that there won’t be an unusual gesture, and we have the tools to do so,” remarked Elkin, noting that talks are ongoing with the Vatican, which understands Israel would oppose such statements. Last July, Elkin rejected reports that the foreign ministry was planning to sign an agreement transferring all or part of King David’s Tomb, located on Mount Zion in Jerusalem, to the Vatican. Above the tomb is located a room in which the Catholic Church claims the “Last Supper” occurred.